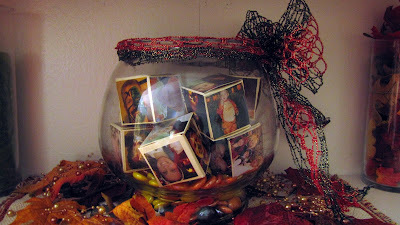 I saw this adorable idea For Family Foto Cubes originally on Style Burb. 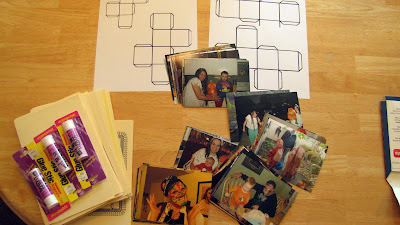 I wanted to do something like this with all the fun Halloween photo's we have so we can see them more. I have been trying really hard this past year to use what I have in the house and not spend any money on new supplies for projects (except maybe glue!) - it has created some major creativity thought process that makes my head hurt sometimes! 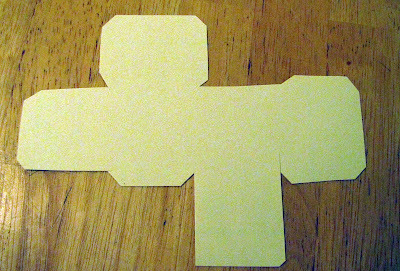 I printed out the pattern then cut each one out to save on ink. 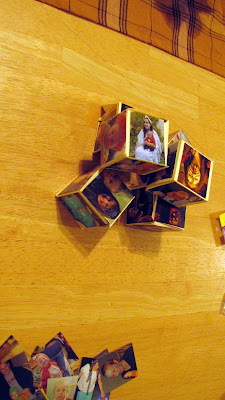 Pictures I used (Some of the pictures were cut into several peices and used for a couple sides of the blocks). I wanted something in the bottom of it and was thinking about using shred - then I remembered I had these half marbles I have used in other things - they are just perfect! I copied and pasted her template she used into my print artist program and adjusted the size to what I needed. 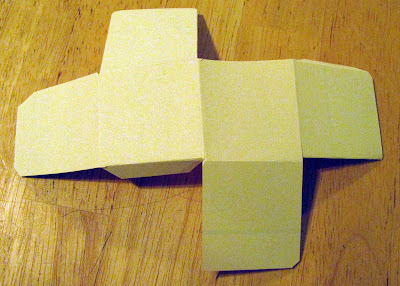 Then I folded them to see where to put the pictures. 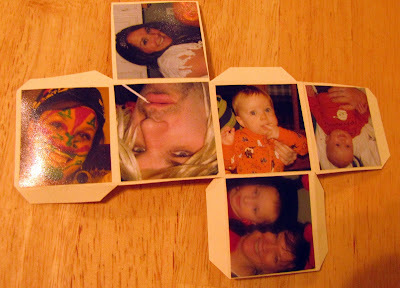 Then I cut a pattern from the template and cut the pictures to fit. Here it is all finished - love it! When I finished a couple of our children walked in and saw it and first thing and had to see all the blocks. 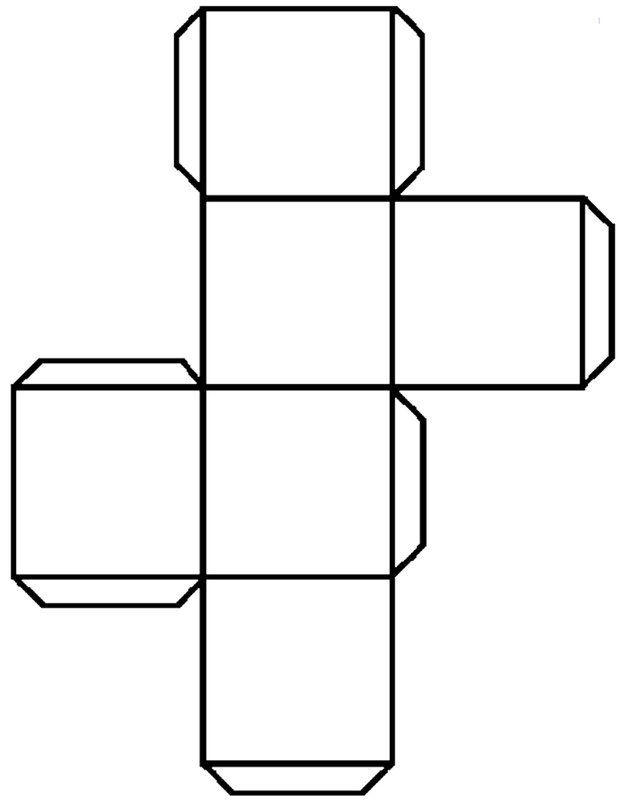 You can add more blocks and make it in a bigger bowl or vase. 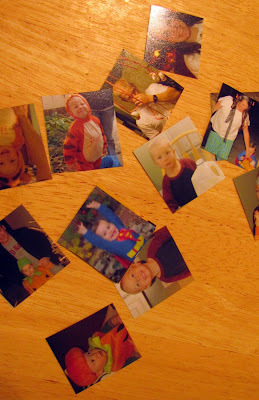 I am thinking about making these for Christmas gifts for grandparents. A classy gift and one I think they would love! Here it is from another angle. Thanks for stopping by! Hope you have a wonderful and fun Halloween season from our house to your's! 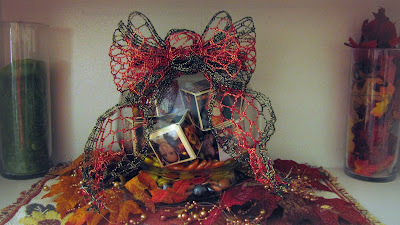 Stop by Paula's blog Buckets of Halloween for tons more spooky fun.